With three hundred and twenty-five stores and a turnover of £323 million, Carpetright is the largest carpet retailer in the UK. They currently have an impressive 20 per cent share of the domestic market and aim to improve this position over the coming twelve months. The company intends to open twenty-four new stores in this period, while developing its prestigious “Harris at home” service. A further development will see an increase in the “Premier range” business, which is carpet delivered to the stores, cut to customers’ specific requirements. Traditional rollstock carpet, ordered and cut to length in-store while the customer waits, will continue to account for around 30 per cent of Carpetright’s annual sales. 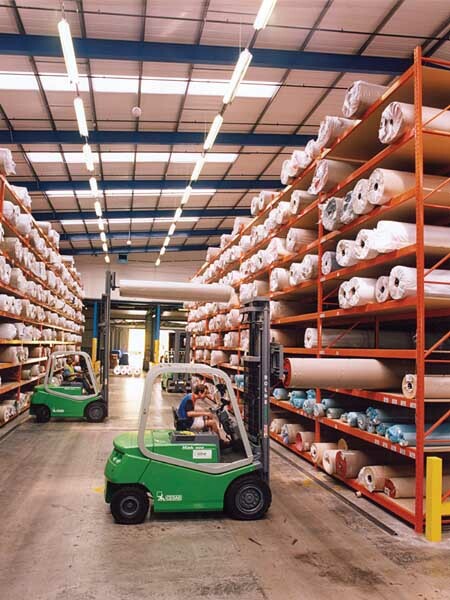 Carpetright’s Headquarters and National Distribution Centre are at Rainham in Essex, three miles from the M25 motorway. 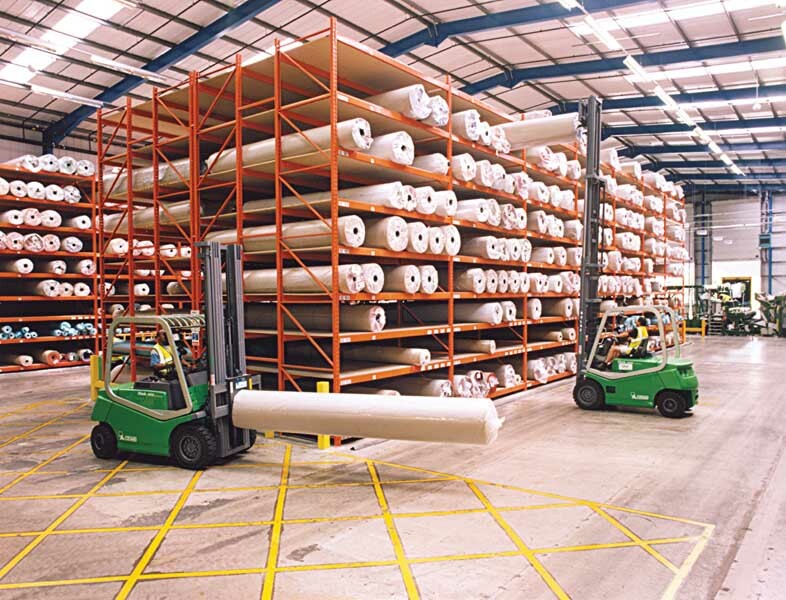 Anticipating the growth in the “Premier range” business, the company recently invested more than one million pounds, converting an existing building to provide additional cutting and storage facilities. Alan Traub, Logistics Operations Controller at the Rainham site, explains. “The Premier range business is growing by more than 20 per cent annually and our existing facility could no longer manage. We recognised that we needed to invest, to keep pace with the demand. Fortunately, we had the space. It was just a question of filling it!” This was achieved by the purchase of a new carpet cutting machine and the installation of a new storage system. 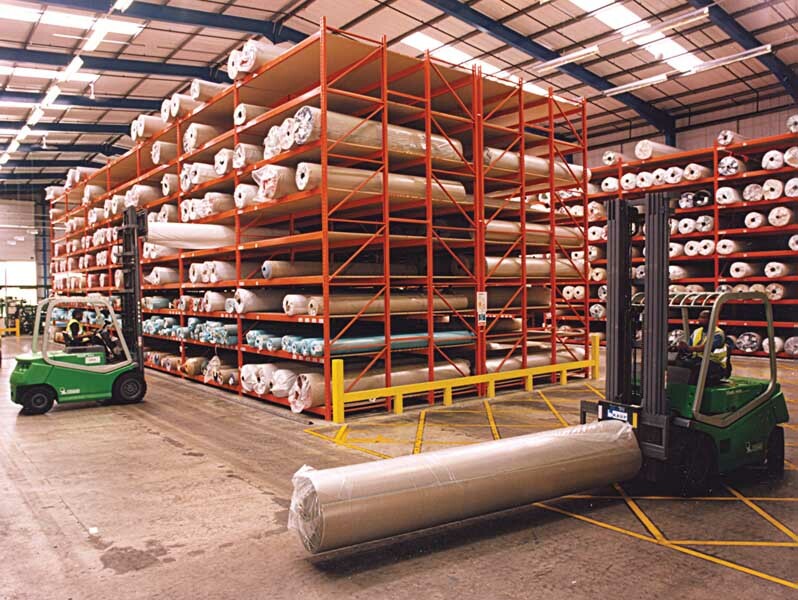 The new facility has given Carpetright the ability to store an additional seventeen hundred rolls of carpet. They currently process around 2,500 Customer orders every day. The racking is laid out with two single entry rows of ten bays each, one on each side of the building. A double entry row of eight bays, runs down the centre of the warehouse. Each bay has nine beam levels, decked out with flush fitting 25mm chipboard. The top beam is 7.1 metres above the ground. 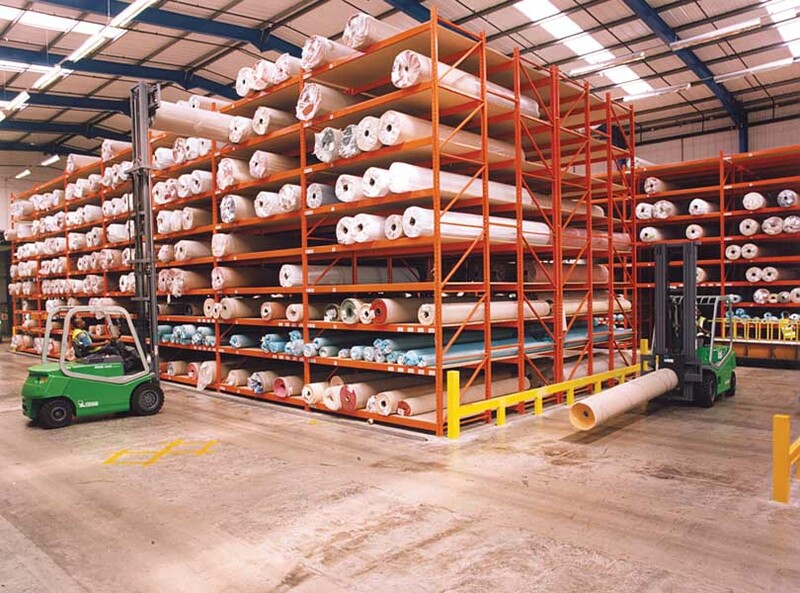 Due to the size of the carpet rolls, each row of racking consists of two uprights linked by spacer bars to produce a bay depth of 4.1 metres. A low profile truck stop rail is fitted 350mm in front of the rack runs to help the fork lift operators with roll placement. Carpetright imposed a very tight ten day schedule for the installation of the racking. However, Redirack completed the job within the allocated time, a fact that impressed Alan Traub. “The entire Redirack team was very professional in the way they approached both the planning and the implementation of the project. They regularly appraised us of the delivery status and took due consideration of all health and safety issues, during installation.” He says.